Cardio workouts are a great way to stay active, lose weight, and keep your body physically fit. 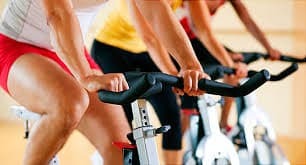 However, running on a treadmill or spinning on a bike each and every workout can become monotonous and tedious. These few tips can help spice up your cardio workout to make burning calories and exercising a little more fun. Instead of sticking to the same exercise program or using the same machine every time you are in the gym, try mixing up your routine. You can head to the pool instead to swim laps, switch up your running route to see new places around town, or utilize different machines in the gym, such as an elliptical, a stair climber, a row machine, or a bike. In addition, fitness classes or picking up a new sport are other great ways to add variety to your workouts. Pilates, Zumba, and spin classes are great calorie burners, and sports, such as tennis, soccer, ultimate frisbee, and basketball, are great ways to get your heart rate up, while having some fun too. Listening to music is a great way to make your workout more exciting, and having your favorite tunes playing can help make a training session seem to go by quicker, while giving you that extra motivation when you are pushing through a tough workout. You can also match your favorite songs to your workouts during cardio exercises by upping the intensity during the chorus or changing up the pace when the song changes. Exercising with a friend is a great way to keep up your motivation to push through a tough workout and can make it more fun. Having a workout partner can help both of you get to the gym to exercise, ensuring that no one is left waiting alone, and that neither of you skip a workout. Working out with a friend is also a great way to push yourself and each other during workouts, and it opens up a bunch of other workout possibilities. With a partner, workouts can include playing against each other in various sports, and you can learn different skills, tips, and tricks from one another as well. Although cardio exercises sometimes get a bad reputation for being boring and repetitive, they don’t have to be that way. If your endurance training seems dull, incorporating your favorite music or switching up your workout program with new exercises or a new face can make a big difference. Making a few adjustments to your workout can be a great way to make your exercise routine more exciting and give you renewed energy and motivation in your workouts.